Tides play a major role in Alaska fishing activities, including the timing of Salmon runs on the Kenai River and halibut or saltwater King Salmon fishing in Cook Inlet and Prince William Sound. The links below will help you in planning your fishing & clamming activities, by understanding the tides in advance. For instance, on severe minus tides you want to be clamming the beaches of Cook Inlet at Clam Gulch or Ninilchik for Alaska Razor Clams, or the beaches of Kachemak Bay for Steamer Clams, not fishing Alaskan Halibut in Cook Inlet. Flat tides, where little water is moving, is best for ocean bottom fishing, yet moving tides can be better for Saltwater King Salmon fishing. The bottom line? Know before you go! Want to learn more about tides in Alaska? Cook Inlet has the 2nd largest tide change in the western hemisphere--right behind the Bay of Funde, Nova Scotia on the other side of the continent. Also of note, are Mt. Redoubt Volcano and Augustine Volcano in Cook Inlet, two of the most recently active volcanoes in our region. Mt. Redoubt has been experiencing steady eruptive activity since the end of January 2009, and Mt. Augustine had some minor eruptive activity during much of 2006. The Cook Inlet or Nuti is a large estuary stretching 180 miles from the Gulf of Alaska to Anchorage in south-central Alaska. It separates the Kenai Peninsula from mainland Alaska and branches into the Knik Arm and Turnagain Arm at its northern end, almost surrounding Anchorage. The Cook Inlet watershed covers about 100,000 km² of southern Alaska, east of the Aleutian Range and south of the Alaska Range, receiving water from its tribuaries: the Knik River, the Little Susitna River, and the Susitna and Matanuska rivers. 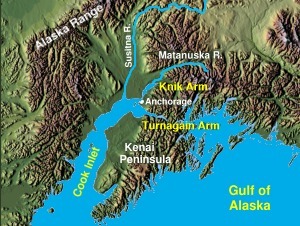 The watershed includes the drainage areas of Mount McKinley. Within the watershed there are several national parks and four historically active volcanoes. Cook Inlet provides navigable access to the port of Anchorage at the northern end, and to the smaller Homer port further south. Approximately 400,000 people live within the Cook Inlet watershed. Before the growth of Anchorage, Knik was the destination for most marine traffic in upper Cook Inlet.